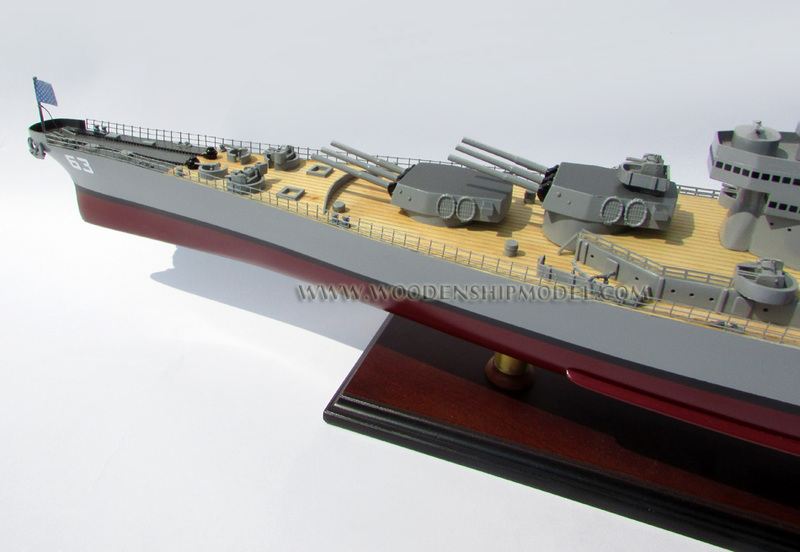 USS Missouri (BB-63) ("Mighty Mo" or "Big Mo") is a United States Navy Iowa-class battleship, and was the third ship of the U.S. Navy to be named in honor of the US state of Missouri. 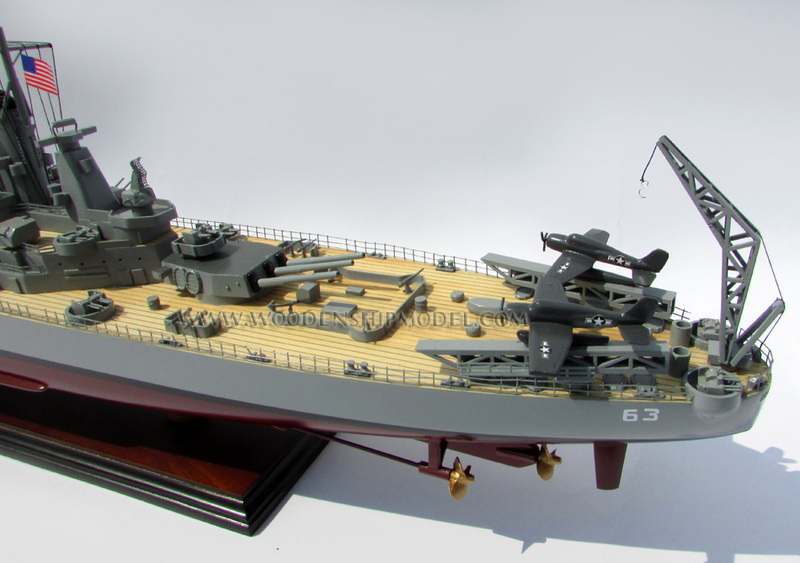 Missouri was the last battleship built by the United States, and was the site of the surrender of the Empire of Japan which ended World War II. Operation Desert Storm in January/February 1991. January 1995. 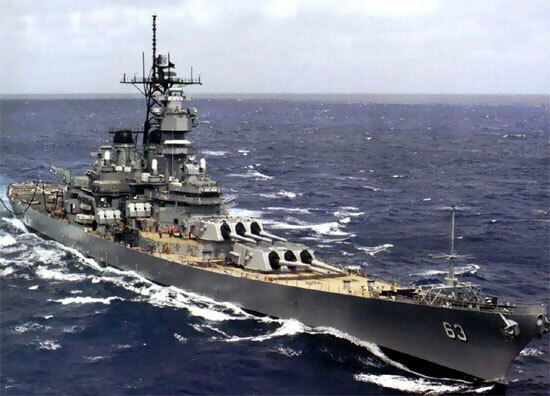 In 1998, she was donated to the USS Missouri Memorial Association and became a museum ship at Pearl Harbor, Hawaii. christened at her launching by Mary Margaret Truman, daughter of Harry S. Truman, then a United States Senator from Missouri. mounts for protection against enemy missiles and aircraft, and Armored Box Launchers and Quad Cell Launchers designed to fire Tomahawk missiles and Harpoon missiles, respectively. 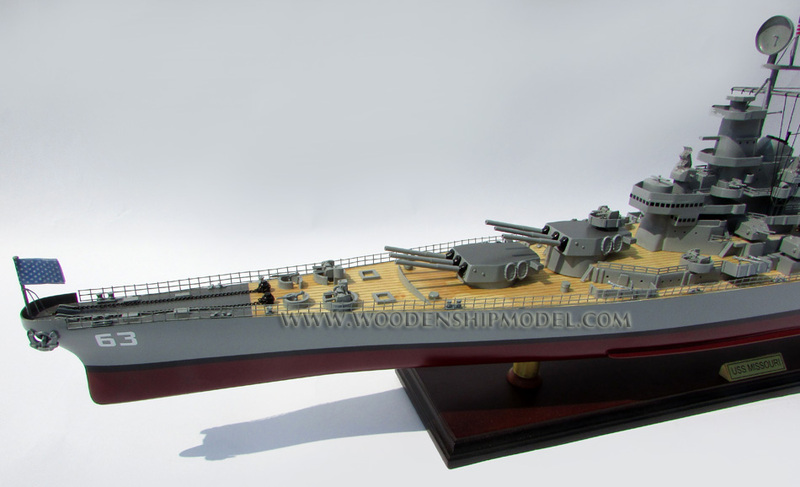 Missouri was the last U.S. battleship to be completed. 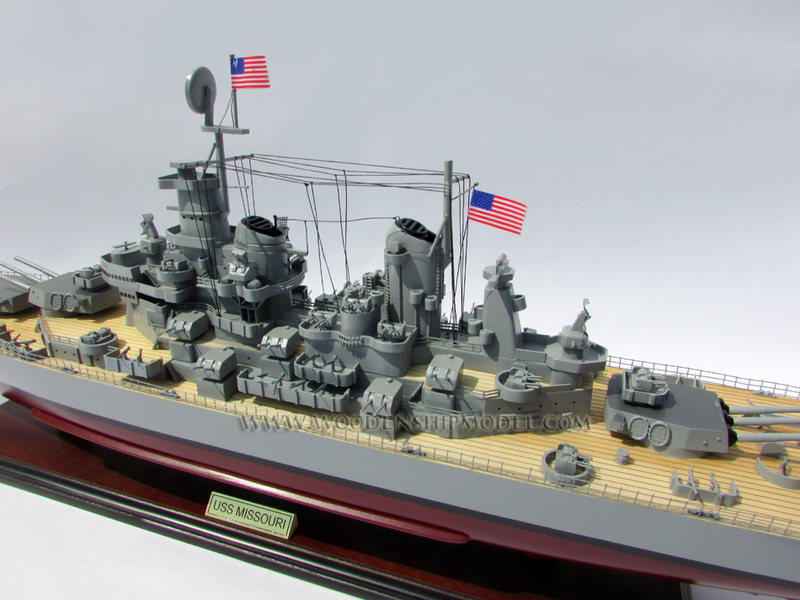 Wisconsin, the highest-numbered U.S. battleship built, was completed before Missouri; BB-65 to BB-71 were ordered but cancelled. task force's aircraft carriers launched the first air strikes against Japan since the famed Doolittle raid, which had been launched from the carrier Hornet in April 1942. 18 March, Missouri shot down four Japanese aircraft. Ulithi until 22 March, then set course for pre-invasion strikes and bombardment of Okinawa. Missouri joined the fast battleships of TF 58 in bombarding the southeast coast of Okinawa on 24 March, an action intended to draw enemy strength from the west coast beaches that would be the actual site of invasion landings. Missouri rejoined the screen of the carriers as Marine and Army units stormed the shores of Okinawa on the morning of 1 April. An attack by Japanese forces was repulsed successfully. About 2305 on 17 April, Missouri detected an enemy submarine 12 mi (19 km) from her formation. Her report set off a hunter-killer operation by the light carrier Bataan and four destroyers, which sank the Japanese submarine I-56. air-surface bombardment before retiring towards Leyte. She arrived at San Pedro, Leyte on 13 June, after almost three months of continuous operations in support of the Okinawa campaign. joined in a shore bombardment on 15 July that severely damaged the Nihon Steel Co. and the Wanishi Ironworks at Muroran, Hokkaido. Japanese no longer had any home waters. The Missouri (left) transfers personnel to the Iowa in advance of the surrender ceremony planned for 2 September. ended the Second World War. Strikes on Hokkaidō and northern Honshū resumed on 9 August, the day the second atomic bomb was dropped. prepare for the signing by Japan of the official instrument of surrender. Vice Marshal Leonard M. Isitt. cherished wish for freedom, tolerance, and justice." sewn a protective linen backing to one side to help secure the fabric from deteriorating, leaving its "wrong side" visible. The flag was displayed in a wood-framed case secured to the bulkhead overlooking the surrender ceremony. ship's stock, according to Missouri's Commanding Officer, Captain Stuart "Sunshine" Murray, and it was "...just a plain ordinary GI-issue flag". later, Missouri boomed out a 21-gun salute as President Truman boarded for Navy Day ceremonies. and again during the funeral ashore. Mediterranean symbolized America's strategic commitment to the region. News media proclaimed her a symbol of U.S. interest in preserving both nations' independence. exercises. On 13 December, during a target practice exercise in the North Atlantic, a star shell accidentally struck the battleship, but without causing injuries. Missouri was accidentally grounded early on the morning of 17 January 1950.
which broadened the Monroe Doctrine by stipulating that an attack on any one of the signatory American states would be considered an attack on all. Atlantic command exercises from the New England coast to the Caribbean, alternated with two midshipman summer training cruises. She was overhauled at Norfolk Naval Shipyard from 23 September 1949 to 17 January 1950.
battleships had been de-activated and decommissioned; however, President Truman refused to allow Missouri to be decommissioned. Against the advice of Secretary of Defense Louis Johnson, Secretary of the Navy John L.
on 1 February 1950 and repaired. Fleet and dispatched from Norfolk on 19 August to support UN forces on the Korean peninsula. the way for the U.S. Eighth Army offensive. Wonsan where she again screened carriers eastward of Wonsan. the Peoples Republic of China (PRC) out of fear that the UN offensive against Korea would create a US-backed enemy on China’s border, and out of concern that the UN offensive in Korea could evolve into a UN war against China. The latter of these two threats had already manifested itself during the Korea War: U.S. F-86 Sabres on patrol in "MiG Alley" frequently crossed into China while pursuing Communist MiGs operating out of Chinese airbases. troops, the U.S. 3rd Infantry Division, were evacuated by way of the sea on 24 December 1950. Missouri fires her guns against enemy positions during the Korean War. Notice the effect on the seawater under the guns. midshipman training cruises to northern Europe. Under the command of Captain John Sylvester, Missouri entered Norfolk Naval Shipyard 18 October 1951 for an overhaul, which lasted until 30 January 1952. Shipyard to prepare for a second tour in the Korean combat zone. destroyed main supply routes along the eastern seaboard of Korea. Sasebo. She was relieved as the 7th Fleet flagship on 6 April by her older sister New Jersey. days later she entered Puget Sound Naval Shipyard where she was decommissioned on 26 February 1955, entering the Bremerton group, Pacific Reserve Fleet. cottage industry grew in the civilian community just outside the gates, selling souvenirs and other memorabilia. Nearly thirty years passed before Missouri next returned to active duty. 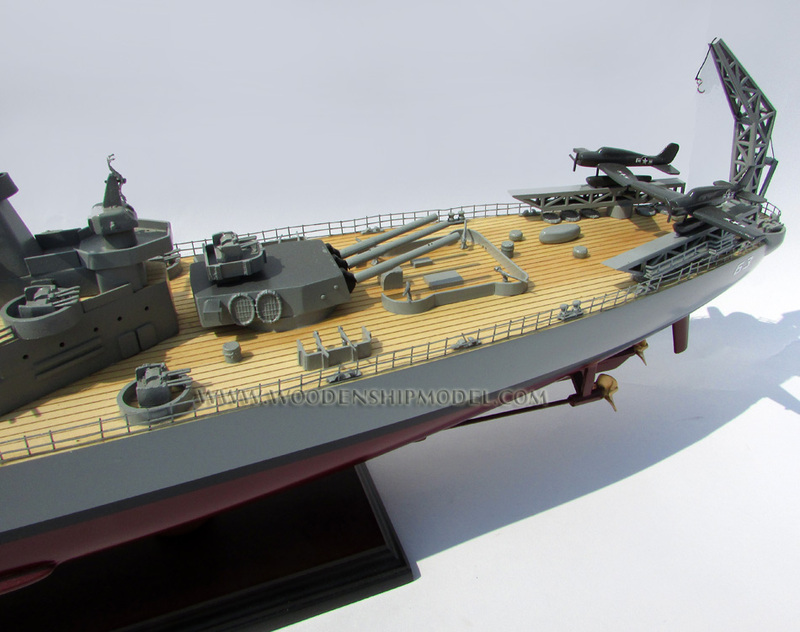 modernization Missouri had her obsolete armament removed: 20 mm and 40 mm anti-aircraft guns, and four of her ten 5-inch (130 mm) gun mounts. Pete Wilson, Secretary of the Navy John Lehman, San Francisco mayor Dianne Feinstein, and Margaret Truman. 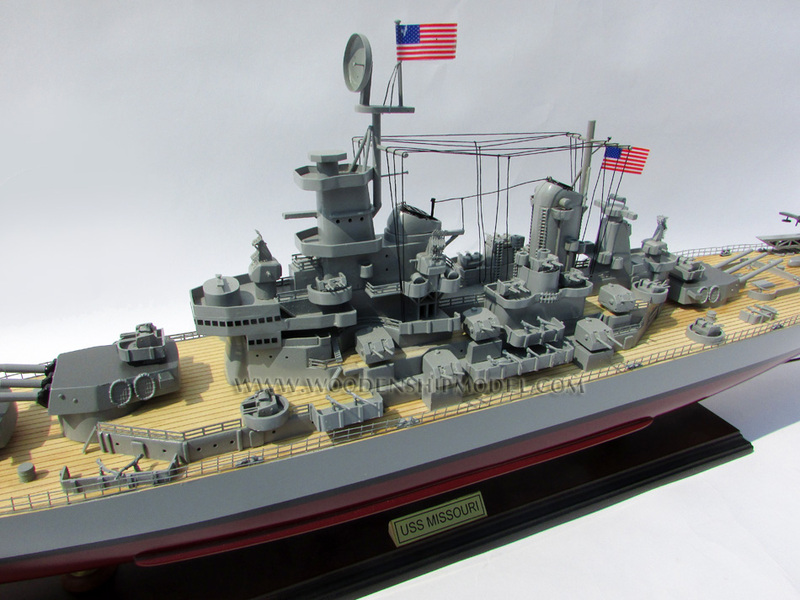 included the first battleship named USS Missouri (BB-11). Strait of Hormuz, keeping her fire control system trained on land-based Iranian Silkworm missile launchers. than 50,000 troops and ships from the navies of Australia, Canada, Japan and the United States. Port visits in 1988 included Vancouver and Victoria in Canada, San Diego, Seattle, and Bremerton. PacEx was a port visit in Pusan, Republic of Korea. 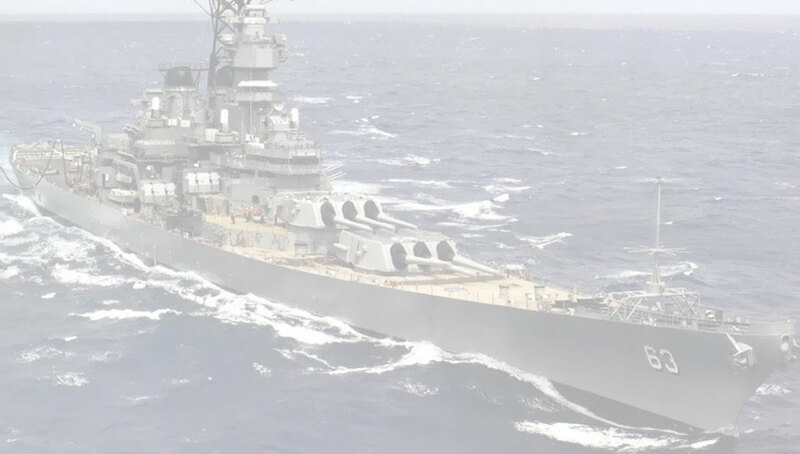 In 1990, Missouri again took part in the RimPac Exercise with ships from Australia, Canada, Japan, Korea, and the U.S.
with a strong force of naval support, to Saudi Arabia and the Persian Gulf area to support a multinational force in a standoff with Iraq. up to Operation Desert Storm, Missouri prepared to launch Tomahawk Land Attack Missiles (TLAMs) and provide naval gunfire support as required. Missouri fired her first Tomahawk missile at Iraqi targets at 01:40 am on 17 January 1991, followed by 27 additional missiles over the next five days. Gloucester within 90 seconds and crashed into the sea roughly 700 yd (640 m) in front of Missouri. Missouri firing her 16" guns during Desert Storm, 6 February 1991. Jarrett, and that it was an accident. The suspicion is that a Phalanx operator on Jarrett may have accidentally fired off a few rounds manually, although there is no evidence to support this. During the operation, Missouri also assisted coalition forces engaged in clearing Iraqi naval mines in the Persian Gulf. By the time the war ended, Missouri had destroyed at least 15 naval mines. conduct patrol and armistice enforcement operations in the northern Persian Gulf until sailing for home on 21 March. Following stops at Fremantle and Hobart, Australia, the warship visited Pearl Harbor before arriving home in April. ceremony, Missouri hosted President George H. W. Bush, the first such presidential visit for the warship since Harry S. Truman boarded the battleship in September 1947.
us. We took her to war, performed magnificently and added another chapter in her history, standing side by side our forerunners in true naval tradition. God bless you all. Missouri remained part of the reserve fleet at Puget Sound Naval Shipyard, Bremerton, Washington, until 12 January 1995, when she was struck from the Naval Vessel Register. On 4 May 1998, Secretary of the Navy John H.
yd (460 m) from the Arizona Memorial. Less than a year later, on 29 January 1999, Missouri was opened as a museum operated by the MMA. Memorial was intended to convey that Missouri now watches over the remains of Arizona so that those interred within Arizona's hull may rest in peace. Landmark because she was extensively modernized in the years following the surrender. and the ship was returned to her berthing station on Battleship Row on 7 January 2010. The ship's grand reopening occurred on 30 January. Korea, and the Persian Gulf.